One year on from the revamp of the former Farm and Pet Place in Abergele, tongues are still wagging at the prospect of further improvements and expansion in the coming months. 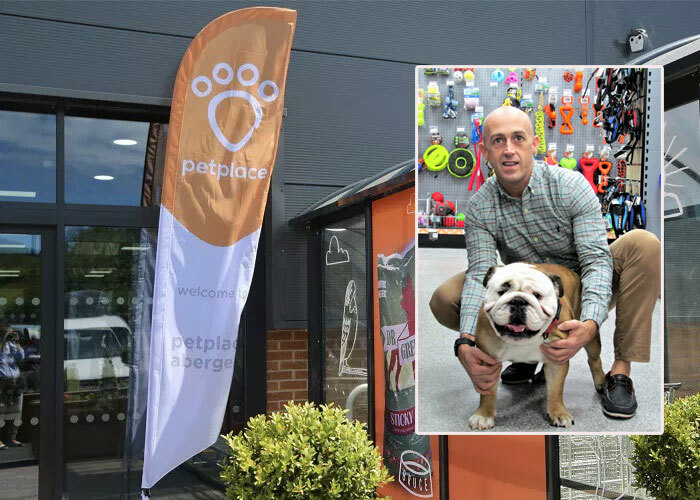 The rebranded PetPlace has already seen a rise in sales and is focused on creating an experience for pets and their owners with top-quality product lines and services centred on health and nutrition. With plans to roll-out the new look at the group’s other stores in Llangefni, Chirk, Mold and Ruthin from 2019, managing director Sion Pritchard has a clear vision for the road ahead. Sion – who joined the firm in 2000 before taking the helm five years ago – has recruited three staff in past weeks to add to the 90 already employed across the region. He says their passionate approach to pet happiness and creature comforts is what sets them apart from the rest. “It became apparent looking at the market and where the sector was going that we needed a change,” said Sion. “The industry has advanced significantly in past years, it’s now more about the health and happiness of pets rather than just filling up with stock – they are very much a part of the family. “The toys and accessories are designed for comfort rather than just functionality, such as memory foam dog beds and advanced dog coats, and the way the store is laid-out makes it a more sociable environment. “Before the rebrand people would drive up, rush in and buy a bag of animal feed or product, but now they take their time and enjoy the whole experience. “There’s more variety, more choice, and it’s a more pleasant place to be. Catering for all groups, from dogs and cats to birds, small holding and small animals, PetPlace has more than 13,500 product lines in store. Business is booming, but for Sion – who turns 38 next week – it’s all about giving back to the community, as well as regular shoppers. The group has raised over £33,000 for Hope House Hospice and will hold further fundraising events in the future. There are also major plans for expansion at the Abergele site, which he looks forward to announcing in the run up to Christmas, and the launch of a unique loyalty card that matches offers and discounts to a customer’s purchase history. “What we’ve created is a whole new experience where the pet comes first,” said Sion. “That will be replicated in Llangefni and then our other locations will follow, which is exciting for customers in those areas, and the staff, who are hugely supportive of the direction we’re travelling in. “PetPlace is in a good position, we want the company and our staff to grow together and are pushing that for no other reason than to raise the quality levels for pets and their owners.